* Apple says the new tax law will help it will contribute $350 billion to the U.S. economy over the next five years. * It says it will create 20,000 new jobs and open a new campus. * Apple expects to pay about $38 billion in taxes for the horde of cash it plans to bring back to the United States. 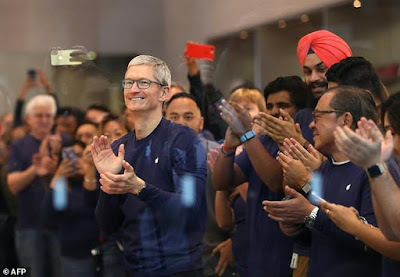 WNU Editor: Apple is already the largest taxpayer in the U.S.. One can only imagine the enormous economic benefits that such a transfer of wealth from overseas to the U.S. economy will bring .... and I am willing to bet that Apple will not be the only company doing this. The global economic and geopolitical impacts from changes in U.S. tax and regulatory should never be underestimated .... and Apple is a perfect example of this point.